After years of developing a new way to link all the services in a fight across domains, the Army put its concept into action in the first-ever field exercise testing Multi-Domain Operations. The result was an array of precision strikes on land and at sea, coordinated through a web of contacts across the Army, Navy, Air Force and Marine Corps, along with allied nations, in the largest maritime exercise in the world, Rim of the Pacific, or RIMPAC. One key target during RIMPAC: the USS Racine, a decommissioned naval vessel. 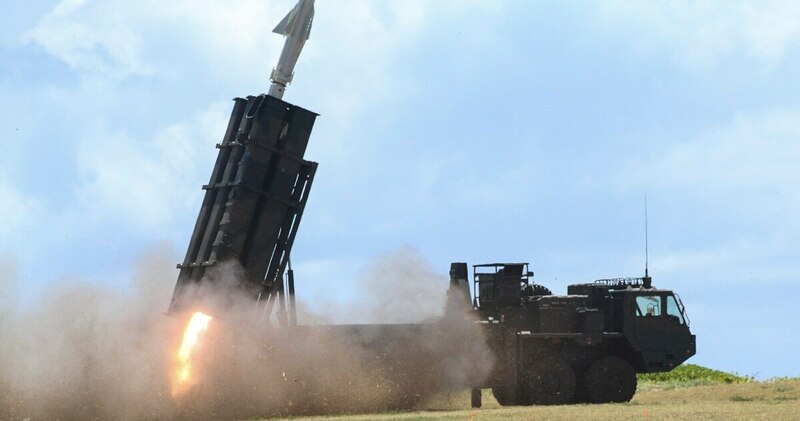 For the first time, the Army participated in a SINKEX, or sinking exercise, at RIMPAC, firing long-range artillery, air attacks and shore-based missiles at the decommissioned ship, sinking it into the Pacific Ocean. That was one way in which the Army’s Multi-Domain Task Force — a pilot program built to test and learn from the former Multi-Domain Battle doctrine, since renamed Multi-Domain Operations — helped bring precision fires into a complex fight. 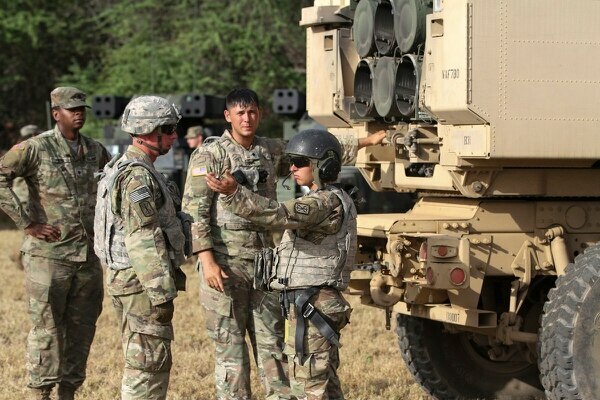 Over the past year, soldiers have conducted war games using these types of coordinated attacks in table top exercises and in virtual settings, but the July RIMPAC exercise brought real metal pounding real targets in real time. Col. Christopher Wendland, commander of the 17th Field Artillery Brigade, which forms the basis of the Multi-Domain Task Force, took 500 personnel with him to run a brigade artillery headquarters to help exploit enemy weaknesses, creating a “bubble” of time to strike. The key, Wendland said, is using these methods to regain the figurative high ground some say has been lost against near-peer adversaries, who can now deny access of U.S. military strengths though a combination of strike, counter-strike, cyber, electronic warfare and other assets. And a slice of that includes fires, one of Army Chief of Staff Gen. Mark Milley’s key priorities. “Multi-Domain Operation relies on multi-domain targeting,” Wendland said. That requires the right people in place with the right skills to put it all together. The job of the headquarters is to “fuse” information from all domains to identify and strike the targets when windows open on the battlefield, he said. 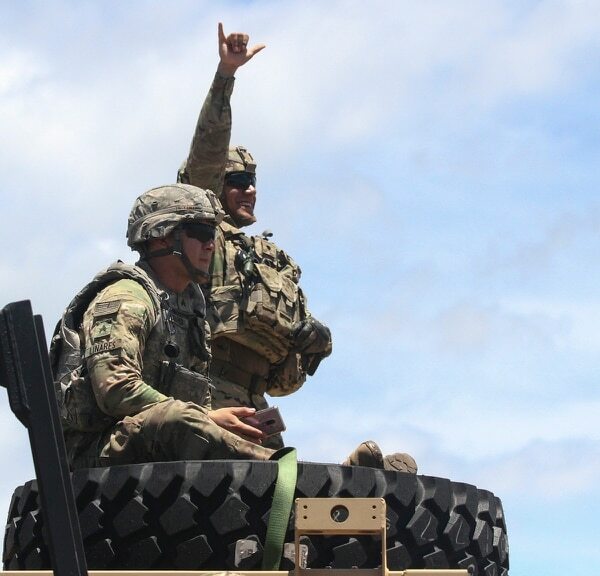 Multi-Domain Operations also provides joint commanders with another attack option in the fight, said Col. Christopher Garver, spokesman for U.S. Army Pacific. 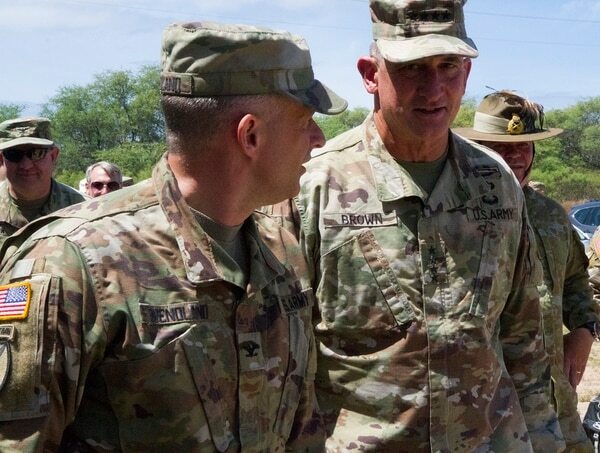 Multi-domain battle, unveiled a year ago by Gen. David Perkins, the top officer at TRADOC, forces the Army to look beyond ground warfare as it prepares to fight on an increasingly complex and unpredictable battlefield. Garver said that Multi-Domain Operations and the task force’s work take combined arms efforts of the past and adds in the cyber and space domains. “How do maritime forces and the land forces work to better integrate their operations to where a joint force commander doesn’t have to worry about matching the appropriate sensor and shooter?” Garver said. Garver said that the soldiers at all levels and even in other job fields can learn from what the artillery brigade did in the exercise. “What the soldier on the ground will see in the future is more direct access at the lower levels into all five domains,” Garver said. And within those domains, planners and commanders must both build and protect strong communication networks so that not only can all U.S. forces share information but also so that partner forces are viewing the same picture. The network of sensors and communications links is complex, Garver said, but the overlapping capabilities create redundancies that make the communications more resilient to attack because if one node is taken out, participants can shift to other pathways to get the information. Garver did not share too many details, but he did say that soldiers operated in degraded environments, a feature of how Multi-Domain Operations is looking for soldiers to continue to shoot, move and communicate even when the communicating part isn’t as readily available. Though much planning and preparation went into the month-long exercise, it’s only a first salvo in how the Army will refine the Multi-Domain Operations doctrine as it applies the lessons learned from this exercise into future events for the task force pilot program, Wendland said. There are military exercises scheduled for the task force in both Guam and Japan next year.